and some hands on experience flying a kite. A two hour lesson covering information you need to know, plus giving you hands-on kite flying time under the guidance of a certified instructor. This lesson will accelerate your kite-flying learning curve and teach you accepted safety practices. the true power of the kite. This is the next step in order to get up and ride! For groups of 7 people or more!!! 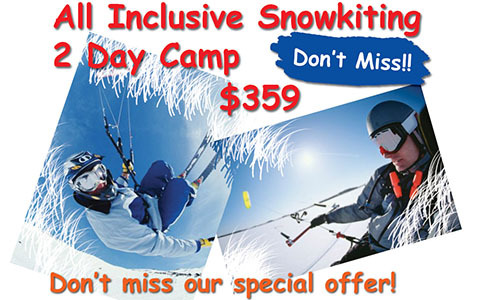 Book your all inclusive snowkiting adventure for you and your friends. Group transportation provided to the location. Have fun learning to snowkite in a safe and snowy environment with experienced IKO kiteboarding instructors. Warm up with the group and enjoy hot food and beverages provided on-site with us! Lunch at local restaurant, snacks and refreshments.